This imposing edifice of the Rashtrapati Niwas/Viceregal Lodge, Shimla is among the British India’s most monumental constructions built in the years 1886-88 during the tenure of Lord Dufferin, the 8th Viceroy of India as their summer capital. It was occupied by 13 Viceroys and the last one was Lord Earl Mountbatten. After India’s Independence it was renamed as Rashtrapati Niwas. In the year 1964, Dr. S. Radhakrishnan, the second President of India handed it over to nation for higher studies by setting up of Indian Institute of Advanced Study and it continues to function as a center of advanced study and research in the humanities and social sciences. In the year 1997 this building was declared protected as monument of national importance under the provisions of Ancient Monuments and Archaeological Sites and Remains Act, 1958. This beautiful architectural heritage is in distressed conditions due to various factors affecting the stability of the structure. To understand the factors responsible for distressed conditions of the building, technical and scientific studies include structural analysis, geological, geotechnical and geophysical investigations, limit equilibrium and Seismic stability analysis, etc. had been carried out in the past. 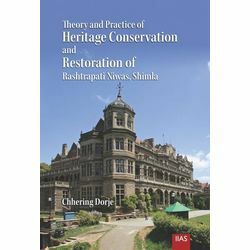 The present monograph on Rashtrapati Niwas, Shimla covered various aspects ranging from historical and architectural accounts to the conservation issues relating to this historical building and will definitely useful and handy for the administrators, decision-makers and implementation agencies for effective monitoring the interventions for better care of the unique architectural heritage and for adapted reuse for future expansion.